Estamos loco? Well maybe just a little! As we were travelling for a very short while with one of our very good friends from back home, we really wanted to make the most of the time & get a few key sights in together. Admittedly at first, yes, we were a little unsure of hiring a car in Mexico, none of us had driven in this part of the world before & were really unsure as to what is was going to be like! Our idea of Mexican roads however, were well off point! In our experience at least, on our 1 day Yucatan road trip, there were no (well hardly any) crazy drivers & nice clear, empty roads, it was a great way to travel & gave us total freedom to enjoy things at our own pace. Beating the crowds at Chichen Itza was our main reason for hiring a car in Merida. Picking up the vehicle the evening before meant that we were ready to set off from our hostel at 5:30, arriving at the ruins well in time for them opening at 8am. We quickly got through the ticket queue & paid our 250 pesos admission fee ** & we’re well happy to be one of the first groups in. Arriving at one of the wonders of the world, before the hoards of people clambering around it just a few hours later was for sure, the right choice. We were able to take our time to stroll around, take it all in & get the obligatory pyramid shots. Trust me after 10am it was really not such a pretty sight! ** If you have any video recording equipment & the site staff see it when you are walking in you will have to go back to a separate queue & pay a separate video recording fee. If you want to save time just hide things such as your GoPro or video camera out of sight. For some reason there is no charge for phones & smaller cameras that also have the ability to record, go figure?! 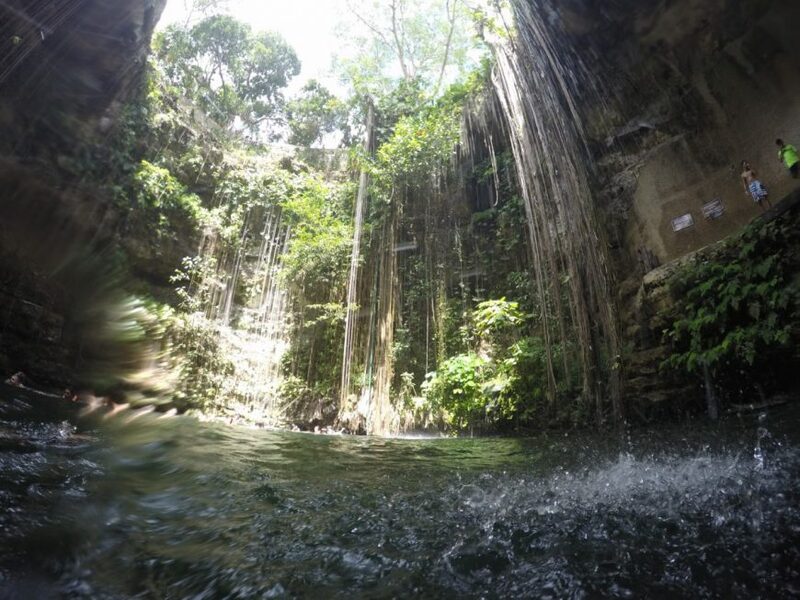 After leaving the ruins we headed over to Ik Kil Cenote, for us this was the only cenote we visited in Mexico. To be completely honest, it was ok. I mean a giant hole full of nice cold water to jump into after walking around in 35 degree heat was not unwelcome, it was just the few hundred other people jumping in with us that kinda dampened the vibe! Our friend Gary also forgot his swimmers which meant that he had to stand on the side boiling even more whilst being trampled over by the hoards trying to enter the cenote. That is travelling for you though, there will always be ups and downs! We spent a minute or 2 complaining about the 70 peso entrance fee & were on our way……. Back on the road after the cenote saga there was some discussion between us about where to go next. I was set on heading to the lesser visited ruins of Ek Balam but with it being another hours drive away & another entrance fee 200 peso the boys were not so sure. After more discussion & persistence from me, the boys agreed on Ek Balam with the condition of a stop off for lunch at Burger King in Vallodoid!! So that was it, off we were again! It really was magical! These ruins were discovered only 30 years ago so are still very much encompassed in their environment, we just got the feeling that we were totally lost in jungle, proper tomb raider style! The site itself is not very big at all but we still spent a few hours just wandering around in awe of the place. 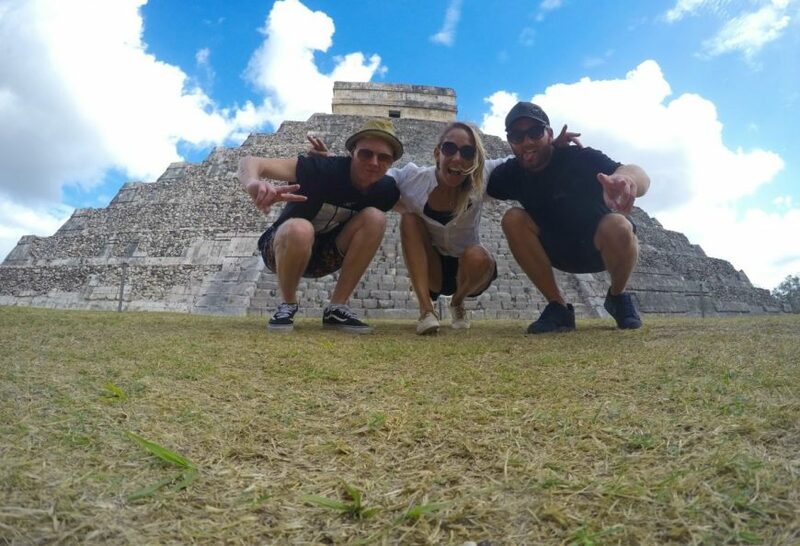 The highlight for us though was that we got to climb the (hundreds) of stairs of the biggest structure, which is actually a tomb of one of the Mayan rulers. The views from the top were just magnificent, it was one of those moments as cheesy as it sounds when you are on the other side of the world, with some of your favourite people & you just look at each other & think, yessssss!!!! This is what it’s all about! It was totally epic! We all agreed that Ek Balam was definetly the highlight of our day. It’s funny because when you love travelling you spend a lot of time thinking of all of those things you want to go & see, all of those wonders you want to go & visit…. Then out of nowhere something else pops up & surprises you! 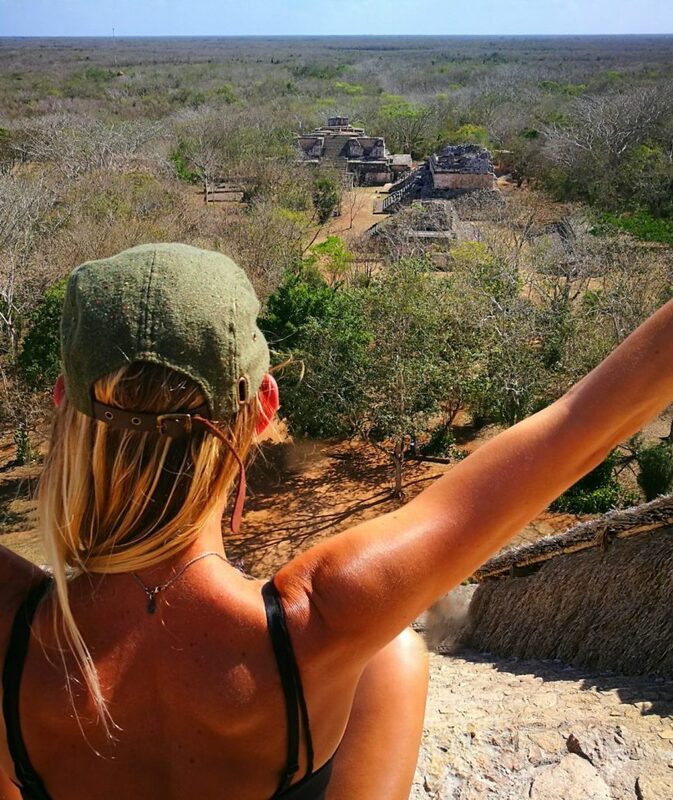 Don’t get us wrong Chichen Itza is still incredible in it’s own right but for us, spending £60 on hiring a car & making that little bit more effort really did make our day! 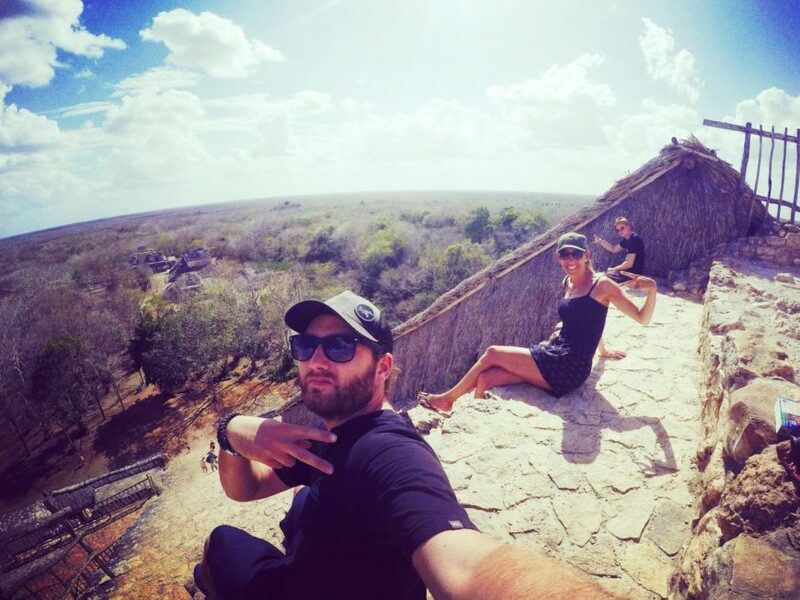 This entry was posted in Mexico and tagged Chichen Itza, Ek Balam, Road Trip. Ok so if I go I have to get up early- ugg! Looks worth it to get photos without hoards of people though.